From Teresa Sherwood of Corcoran, California on 11/20/2018 . This is a great product for us. 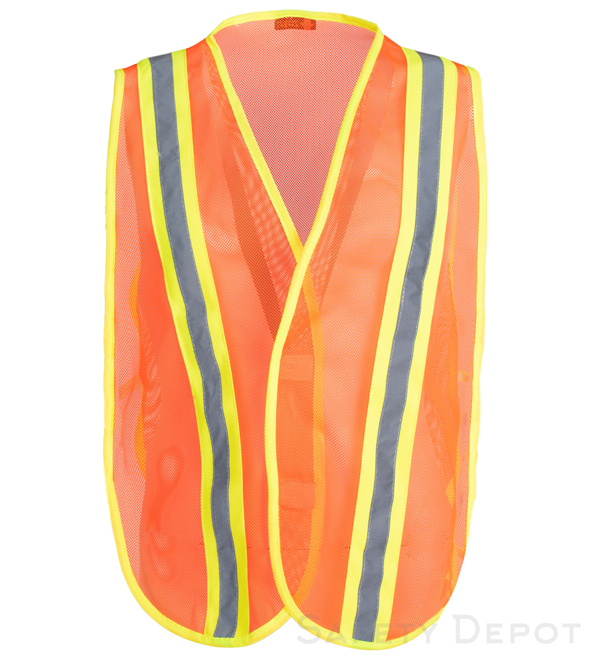 We frequently need additional vests for temporary workers, and when inspecting job sites. From Sharon Boyle of Bellevue, Idaho on 1/11/2018 . From Celia Cole of Orlando, Florida on 4/24/2017 . This was a great deal for the price. We purchased it for an event and it worked perfectly! Great color and didn't come across as "cheap". Would recommend this product. From Maria Reyes of Dallas, Texas on 11/6/2016 . Excellent and for a great price. From Douglas Dukett of Bowling Green, Ohio on 5/16/2016 . From purchaser of North East, Pennsylvania on 4/21/2016 . We purchase these vests on a regular basis for our temporary employees. They are economical for that use. They hold up pretty well for average size folks. Larger people will need a larger size vest if you want them to last. They are great for the heat of the summer due to the mesh fabric. We like them. From Jeud of Paramount, California on 4/19/2016 . Works great, received as stated on shipment estimate, just in time for our volunteer day. Thanks! Perfect product with even better customer service! From LA Works of Los Angeles, California on 1/21/2016 . I needed 100 vest for an event that was two days away, so I was panicking! I called Safety Depot and they were extremely friendly and willing to help me out of this sticky situation. I was able to pick up my full order the next morning, with no problems. Thank you for your efficiency and awesome customer service Safety Depot staff. From Orival Thompson of Jacksonville, Florida on 12/29/2015 . From Anonymous of Oceanside, California on 12/8/2015 . The vest is easy to see and the reflective stripes work well. I feel very visible in it. It is lightweight mesh that fits easily over my clothes.